Lorena B. Moore is a blacksmith/metalworker who lives in Tucson, Arizona. 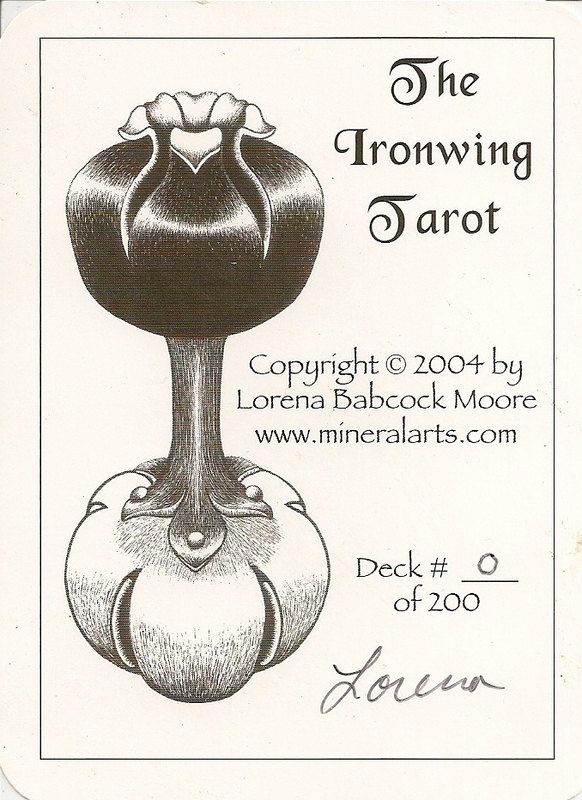 Her Ironwing Tarot celebrates the ancient art of blacksmithing and its connection with shamanism. The deck is inspired by nature, geology and metallurgy, and the sacred Black Metal itself. The Ironwing deck consists of slightly renamed Majors as follows: The Lodestone, The Magician, Red Earth, The Forge, The Anvil, Tradition, Connection, The Road, Crystallization, The Hermit, The Wheel, Strength, Trance, Death, Quench, Molten Iron, The Tower, The Star, The Moon, The Sun, The Furnace and The World. The Majors depict iron geology, blacksmithing tools, and metal refining processes. 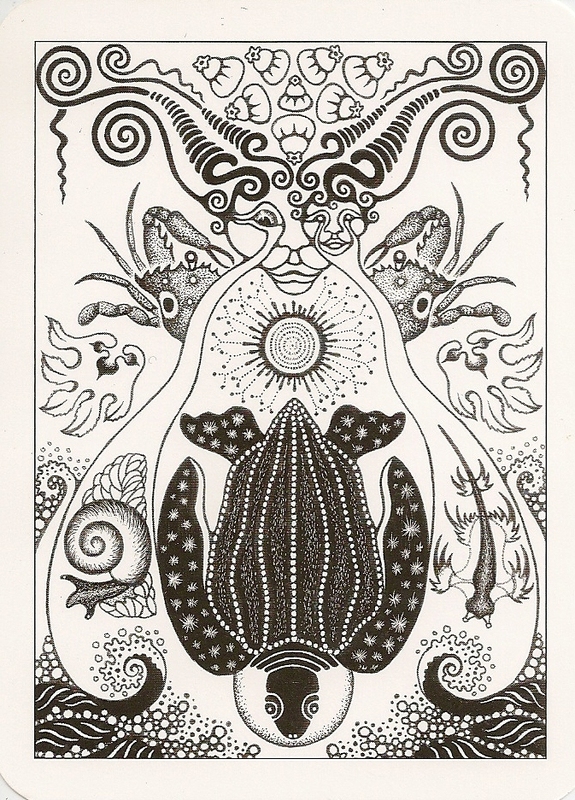 Vignettes of the shaman’s initiatory experience also appear in many of the cards. The Minor Arcana beginning with Ore (Ace) and then proceeding from Two to Ten. The suits are Spikes (fire) which refer to thorns, spines, twigs and resins, Coils (water) refering to shells, flowers and beach find, Blades(air), which refer to feathers, leaves, herbs and paper, while Bells (earth) refering to roots, gnarled wood, fungi and seeds. 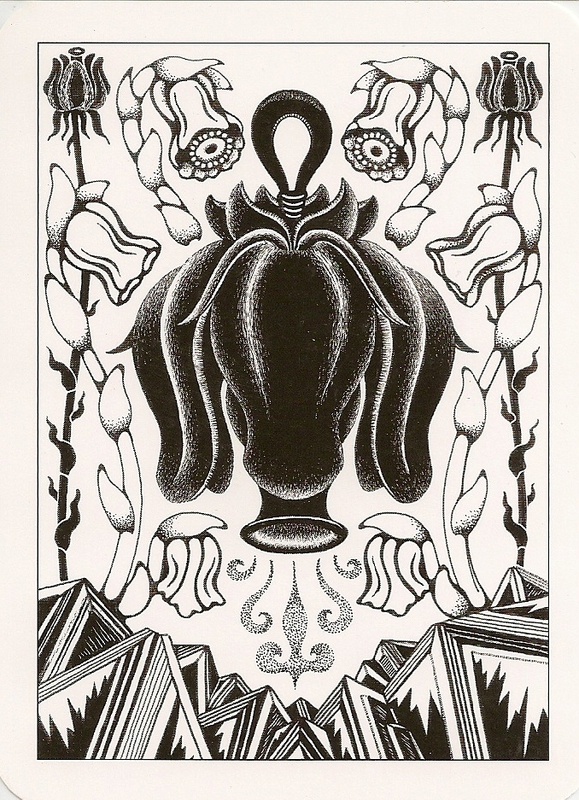 The Art is black and white ink scratchboard drawings. Major Arcana accented with three shades of red ochre, a natural earth pigment and iron ore. The Card backs are non-reversible. The card dimensions are 2.5" x 4.6", printed on white stock with a matte finish. This size is a little wider and shorter than a standard deck. The deck comes with a spiral bound book, that includes, beyond card descriptions, short essays on iron geology and mythology, blacksmithing and Shamanism.The book is available for free download as pdf on the artist' website.